The joys of wearing cute, stylish clothes that allow you to feel the warmth of the sun on your skin can make you feel good about yourself. For some people, however, wearing short sleeves and tank tops make them feel embarrassed about the appearance of their upper arms. They may avoid wearing arm-revealing clothes altogether. Patients struggling with excess fat and skin hanging from their arms no longer have to worry, as Dr. Henry can provide them with the perfect solution: arm lift surgery. Arm lift surgery is a cosmetic procedure that can enhance the upper portion of your arms and give them a slimmer, toned appearance. If you are interested in this procedure, here are a few things you will need to know to determine the best approach for your surgery. Also known as brachioplasty, arm lift surgery can improve the tone and contour of a person’s upper arms. The procedure is done using an incision along your arms to remove excess fat and skin. The arms will then be reshaped for a more aesthetically pleasing appearance. A traditional arm lift is the best choice for patients who have a significant amount of excess skin on their upper arms, especially after massive weight loss. This technique will require an incision to be made from the armpit all the way down to the elbow. The excess fat and skin are removed, and the remaining skin is re-draped over the arm and tightened. The incisions are closed using sutures or bandages. The resulting scar is discreetly located on the inside of the arm. The mini arm lift can be performed on patients who have a minimal amount of excess skin on the upper arms. A short incision will be made from the armpit to the area where the inner arm connects to the shoulder. This approach will result in less scarring, but may not be appropriate for patients that have moderate to severe skin laxity. Some patients have good skin elasticity, but have excess fat on their arms. Others have fat and skin that need to be removed. Liposuction involves the use of a suction device to remove unwanted fat from the arms permanently. Because liposuction requires no removal of skin, there will be little to no visible scarring. However, the results will be subtle since only fat is removed. Any hanging skin on the arms will remain. Scars are more apparent on the arms than any other area of the body and cannot be hidden as easily. 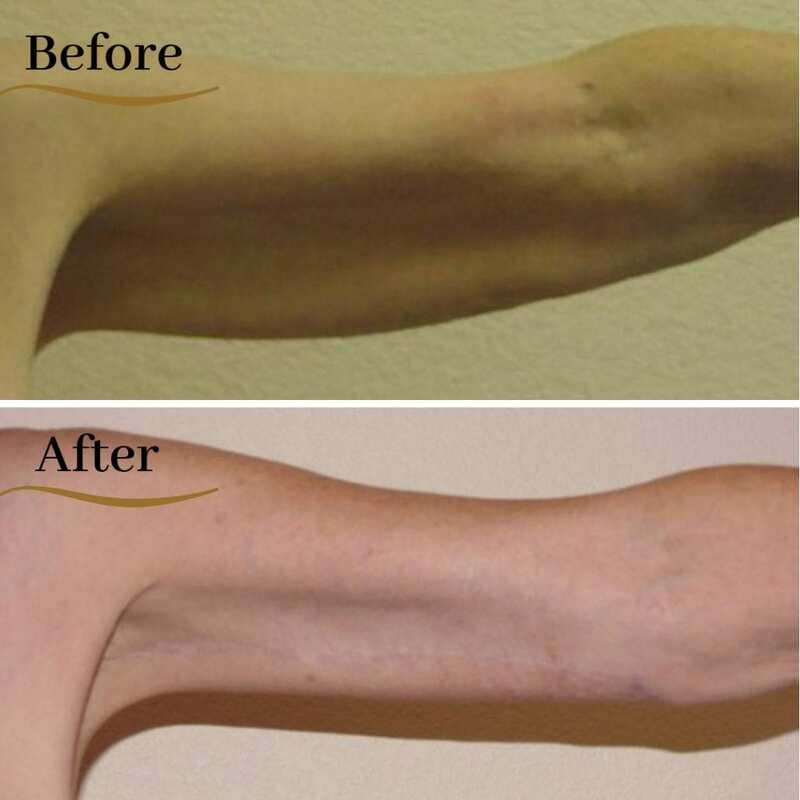 Although it is impossible to perform arm lift surgery without producing any scars, Dr. Henry uses advanced techniques and technologies to reduce any visible scarring. Scars that do appear will most likely fade over time. Patients who are unhappy with the appearance of their arms and wish to undergo arm lift surgery can schedule a consultation with Dr. Henry by calling our office at (415) 997-0918.